The results are in! 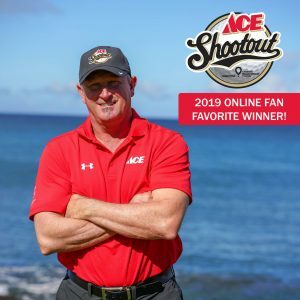 The fans voted for their favorite athlete from the 2019 Ace Shootout benefiting Children’s Miracle Network Hospitals. Congratulations to Bret Saberhagen for winning the title of the 2019 Ace Shootout Online Fan Favorite! Viewers tuned in on March 24 on Golf Channel to watch the premier of the 2019 Ace Shootout benefiting Children’s Miracle Network Hospitals. From March 17 – 31, the public voted for their celebrity athlete from this year’s event. As the 2019 Online Fan Favorite, Bret has won a $10,000 donation for Akron Children’s Hospital. Special thanks to Milwaukee Tool for sponsoring this year’s Fan Favorite online voting. For the past 22 years, Ace Hardware has hosted the Ace Shootout, benefiting Children’s Miracle Network Hospitals®. In that time, more than $24 million has been raised and millions of children have been treated with quality care because of the generosity of Ace and their vendors. This annual event not only raises much-needed funds for our member hospitals, it showcases the great partnership we at CMN Hospitals have with Ace. Thanks to the players, vendor sponsors, staff, volunteers and fans for joining us at the Ace Shootout each year. This event is not only fun and entertaining; it also raises money to help us treat the millions of children we serve each year in our hospitals.